In our newsletter, we try to give you an accurate listing of the produce in your box; however, since the newsletter is published before the harvest, we may sometimes substitute some vegetables for others. The information provided here is also published each week on our website. APPLES (Liberty): modern American apple variety with deep dark red color, very similar in appearance to McIntosh, but its flavor is tarter and its flesh is crisper. It has a flavor all its own. How to use: excellent for fresh eating, but makes a good dessert apple, good for juicing, and creates a pinkish applesauce. SHELLING BEANS (Tongue of Fire): round, ivory-tan, Italian heirloom shelling bean with red streaks on stringless, red-streaked cream/green pods–eat the fresh-shelled beans, not the pods; have nutty flavor and creamy texture when cooked. See Week 10 for storage & usage information. BEETS: round, smooth, deep red roots with sweet flavor and medium-tall, red-veined green leaves. (*The beet greens are especially delicious right now and are a good “spinach” substitute.) See Week 3 newsletter for usage and storage information. CARROTS (Mokum): a very sweet, slender, “pencil carrot” with edible green leaves. Greens are delicious in soups and also salads. How to store: Remove greens from roots and refrigerate dry and unwashed roots in plastic bag for up to 2 weeks; greens may last up to a week refrigerated in plastic bag. CELERY: tall, crisp, glossy green stalks and leaves with a strong, celery flavor; contains vitamins A, C, B-complex, and E with some other minerals; also high in fiber and sodium; *Organic celery tends to be a darker green, since it’s unblanched like commercial celery. The darker green color indicates more minerals and vitamins, but also is a bit stronger, so you may want to use a little less than you normally would. How to use: typically eaten raw and used in salads; ribs and leaves can be added to casseroles, soups, stews, and stir-fries. How to store: refrigerate in plastic bag for up to 2 weeks; can be frozen in slices on a cookie sheet and then packed into freezer bags; celery leaves can be dehydrated and added to soups or stews. SWEET CORN: You will receive Montauk (small, fancy, bicolor kernels on 8” long ears with superior, sweet flavor) and/or Potawatomi (yellow kernels with excellent sweet flavor). See Week 12 for usage and storage information. U-PICK FLOWERS (only available on the farm): You may pick a bouquet of up to 15 stems as part of your share. GARLIC: a bulb of several papery white cloves. See Week 6 for usage and storage information. Curly Leaf Parsley—curly, green leaves have a strong parsley/celery flavor for use dried or fresh; often used as a garnish, but excellent in salads, eggs, mashed potatoes, soups, pasta and vegetable dishes. French Sorrel–slightly tart, lemon-flavored green; excellent for salads, soups, and sauces; can be used in omelets, breads, or cooked as a side dish; refrigerate in bag for up to 3 days. Oregano–member of the mint family and is similar to marjoram, but not as sweet and more pungent flavor and aroma; good in soups and tomato-based dishes. Tarragon—its flavor is delicate and almost licorice or anise-like; an essential herb in French cuisine; exceptional in egg dishes, poached fish, chicken, mushrooms, salad dressings and with other vegetables. *Genovese Basil (optional)—Still time for Pesto this week, although the leaves are not perfect! An herb with sweet, spicy, shiny, green leaves. Can be stored in a jar, vase, or glass of water on your counter or table top. Do NOT refrigerate! GREEN CURLY KALE: well-ruffled, curly green leaves on green stems; this variety makes a good, roasted “kale chip”. See Week 1 newsletter for usage and storage information. HOT PEPPERS: You will receive Jalapeño (small and conical pepper, ranging from green to red; hot chile pepper used commonly in Mexican or southwestern cooking). SWEET RED PEPPERS: You will receive Red Knight Bell (big, blocky, thick-walled, green-to-red pepper with sweet flesh). See Week 16 for usage and storage information. POTATOES: You will receive Kerr’s Pink (very pale skin and cream flesh; mealy, cooked texture, so makes a good Specialty/Salad Potato variety; good roasted, mashed, or in salads) and Russian Banana Fingerling (an heirloom potato with small, banana-shaped tubers with yellow skin and light yellow flesh; used by chefs for its delicious flavor and smooth “waxy” texture that doesn’t fall apart when cooked; good baked, boiled, or in salads). See Week 9 for storage & usage information. How to use: Cooking does minimize the intensity of their color, but can be braised or roasted like a turnip, or mashed like a rutabaga; color is vibrant when served raw in a salad or in a veggie plate with some dip. Can also be pickled. How to store: refrigerate in plastic bag/damp towel for 1-2 weeks. MESCLUN SALAD MIX: mix of red and green leaves that includes spicy items such as Arugula, Red Giant mustard and Bianca Riccia endive with a mild base of red lettuces, Kyona Mizuna, and Tatsoi. See Week 1 for storage and usage information. WINTER SQUASH: You will receive Sunshine Kabocha (red-orange, flat-round fruit with dry, sweet, bright orange flesh; excellent for baking, mashing, and pies). See Week 17 for usage and storage information. How to store: should be spread out in a warm, humid place for about a week to cure. Once cured, store in a cool, dark place like winter squash. *Do not store in plastic or in fridge, unless cooked. 1. ENDING SUMMER CSA DATES: The end is drawing near. This is just a reminder that our summer shares are ending next week. That means Oct. 9 (Wed.), Oct. 11 (Fri.), and Oct. 12 (Sat.) are the last distribution days. 2. “TASTE OF TANTRÉ” AT ZINGERMAN’S on FOURTH: Join our Tantré Farm crew at Zingerman’s Events on Fourth, on Thursday, Oct. 10, at 7 p.m. for a ZingFeast Dinner featuring Tantré Farm produce. Chef Rodger Bowser will be creating a multi-course meal with the best of Tantre’s fall harvest. This is a delicious meal for $50/person or $60/with beer. Call early 734-663-3400 to reserve a space. 3. EXTENDED FALL CSA SHARE AVAILABLE FOR 2013: We are offering an Extended Fall CSA Share for $96 for 3 weeks from Oct. 13 through Nov. 2. If you’re interested please let us know by Oct. 11. See our website or newsletters for more details. 4. THANKSGIVING SHARES! We are offering a distribution in November for you to stock up on vegetables before the holiday or for winter storage for $110. This share will be available for pick up only on Nov. 23, the Saturday before Thanksgiving. If you’re interested, please let us know by Nov. 10. See our website or newsletters for more details. 5. BAGS, BAGS, BAGS & Yogurt Containers!! We still could use some if you have some, but only grocery size please, NOT bread bags or small sizes. We also are low on quart size (ONLY!) yogurt containers for taking flowers home on the farm. 6. HARVEST AT THE FARM: Please call ahead if you plan to pick on other days besides Farm Distribution Days (Wed. and Fri.), so we can make sure someone is around to help you. U-pick Flowers—This week you may pick 1 bouquet of up to 16 stems for “free” as part of your share. Extra bouquets will be $4 each. U-pick Tomatoes—Please feel free to harvest them yourselves this week. $0.50/lb. Please call ahead, if coming on other days than Wed. or Fri.
U-pick Basil—$3/lb. near the house or giant ones in the field. Ann Arbor Farmers’ Market (Wed.)–7 A.M. to 12 P.M.
Farm (Wed.)–10 A.M. to 7 P.M.
Washtenaw Food Hub (Wed.) –6 P.M. to 8 P.M.
Farm (Fri.)–2 P.M. to 7 P.M.
Community High School (Sat.) –7 A.M. to 12 P.M.
Washtenaw Food Hub (Sat. )– 8 A.M. to 12 P.M.
Chelsea Farmers’ Market (Sat. )–8 A.M. to 12 P.M. INTERESTED IN JOINING OUR SUMMER CSA IN 2014? 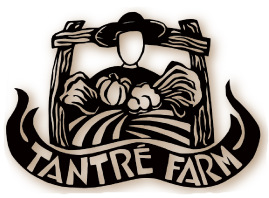 If you are able and willing to support Tantré Farm CSA again next summer, we would love to hear from you. Due to so many members switching from on farm pick up to off farm pick up and vs. throughout the summer and ease of recordkeeping, we will be offering shares for one single price this next season, so all shares will cost $625. We will still offer a 20 week summer season from June through the middle of October. Another change will be that pick up time at the Washtenaw Food Hub on Saturdays will be from 10 AM until noon, instead of from 8 until noon as it is now. We will be accepting $100 deposits ($25 of that deposit is nonrefundable if you choose to cancel your share) to reserve your share for 2014 starting now. Ideally it would be great if you were able to pay in larger amounts or in 2 or 3 installments earlier, instead of waiting to pay off your final payment of your share in May, since we really have most of our major expenses during the winter. Please keep in mind that if you pay in $100 increments each month starting now, you can have your share paid off before the payment deadline on May 1. This works well with automatic payments from your bank, so you don’t have to remember to send a check each month. Also, several members actually postdate checks with monthly payments ahead of time, which works very well for us too. Registration forms and Payment Envelopes will be at every distribution site starting this week. We encourage you to sign up sometime within the next few months, because we are opening up our membership to non members as well at this time. Please ask for a Registration Form at the Distribution Sites, but it will also be sent online later this week, and posted on the website as well. We would like to encourage some kind of financial commitment this fall, if you are able, so that we may better plan for next season. Thank you for your continued support this season, and hope you enjoy these last few weeks of bounty. Peel the very outer layer off the radishes – not too much, because you still want the outer layer to look green. Grate or shred the watermelon radishes using a julienne slicer or the largest holes of a box grater, or your food processor. In a large bowl, toss the watermelon radish shreds with the lemon juice and olive oil, and add a pinch of salt. Taste and add more salt if you like. Serve chilled. WINTER VEGETABLE CHOWDER (from 366 Simply Delicious Dairy Free Recipes by Robin Robertson) Serves 6. Heat the oil in a large saucepan over medium heat and cook onions, celery, turnip, and carrot for 5 minutes. Add sweet potato, squash, bell pepper, garlic, stock or water, and herbs. Reduce heat and simmer for 20 minutes or until vegetables are tender. Boil greens in lightly salted water for 3 to 5 minutes. Drain and set aside. Purée soup in a blender (or use a stick blender in saucepan) until smooth. Return to saucepan. Stir in the soymilk, cooked greens, and salt and pepper to taste. Slowly heat the soup, being very careful not to boil. Serve.